We have found a hidden treasure, and it is a “barn find” in the truest sense of the word. This 1962 Jaguar E-Type Roadster is a unique example, whose previous owner modified and modeled after Jaguar's ultra-rare and early lightweight race car, the E2A. The Roadster was rediscovered several years ago, after spending 37 years in storage. The car’s previous owner had started the transformation of this stock E-Type to a similar presentation as the famous E2A racer, but was unfortunately unable to complete the restoration and put the car in storage. The E-Type is a great restoration candidate to either 1) complete the E2A concept and look, or 2) to bring the car back to a stock XKE roadster configuration. Recently, Jaguar professionals at Classic Showcase have woken the car up and have put the Racer in running condition. The car would greatly benefit from a professional restoration, and you may commission our team to meet your vision with this car - please inquire. At a minimum, the Roadster will require a full service and tire replacement, etc. before it is put back on the road. 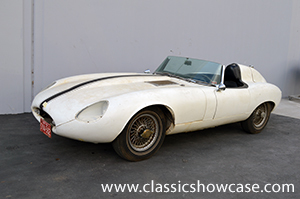 This unique E-Type provides the serious Jaguar restorer or collector looking for a unique project the opportunity to bring this storied treasure aesthetically back to life, and would make an excellent choice for modified campaigning and eventual competition! The Series 1 was introduced, initially for export only, in March 1961. The domestic market launch came four months later in July 1961. The cars at this time used the triple SU carbureted 3.8 liter six-cylinder Jaguar XK6 engine from the XK 150 S. The early cars have leather-upholstered bucket seats, an aluminum-trimmed center instrument panel and console, and a Moss four-speed gearbox. The Series 1 can be recognized by glass-covered headlights, small "mouth" opening at the front, signal lights and tail-lights above bumpers and exhaust tips under the number plate in the rear. Jaguar's second E-Type concept was the E2A which, unlike the E1A, was constructed from a steel chassis with an aluminum body. This car was completed as a racing car as it was thought by Jaguar at the time it would provide a better testing ground. E2A used a 3-liter version of the XK engine with a Lucas fuel injection system. The "'Lightweight' E-Type" which was apparently intended as a follow-up to the D-Type. Jaguar planned to produce 18 units but ultimately only a dozen were reportedly built. Of those, two have been converted to Low-Drag form and two others are known to have been wrecked and deemed to be beyond repair, although one has now been rebuilt. These are exceedingly rare and sought after by collectors.